American Roads and Global Highways has so many great articles you may want to search it for your favorite places or new exciting destinations. Monterey Bay Fish Grotto is one of those rare places that is more than the sum of its parts. Sure, it's serves great seafood. 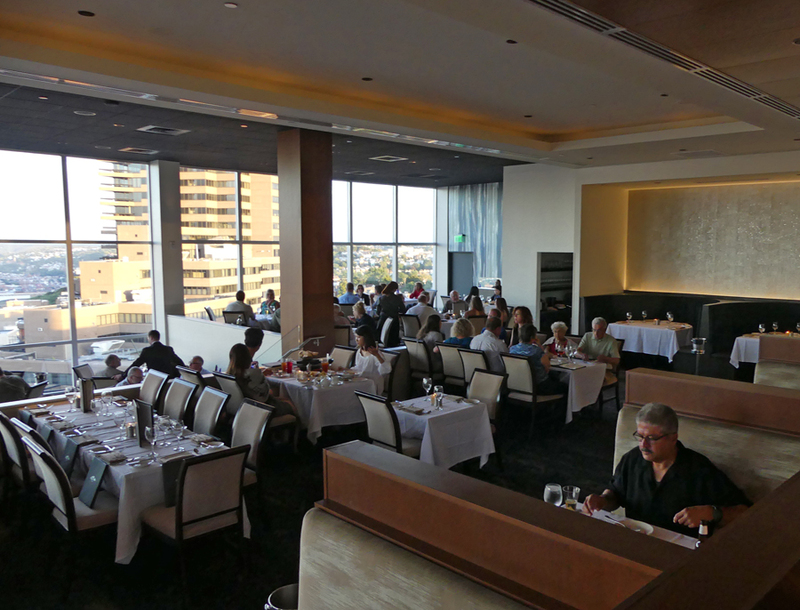 It has a chef that is not afraid to blend his Eastern European traditions with modern recipes. 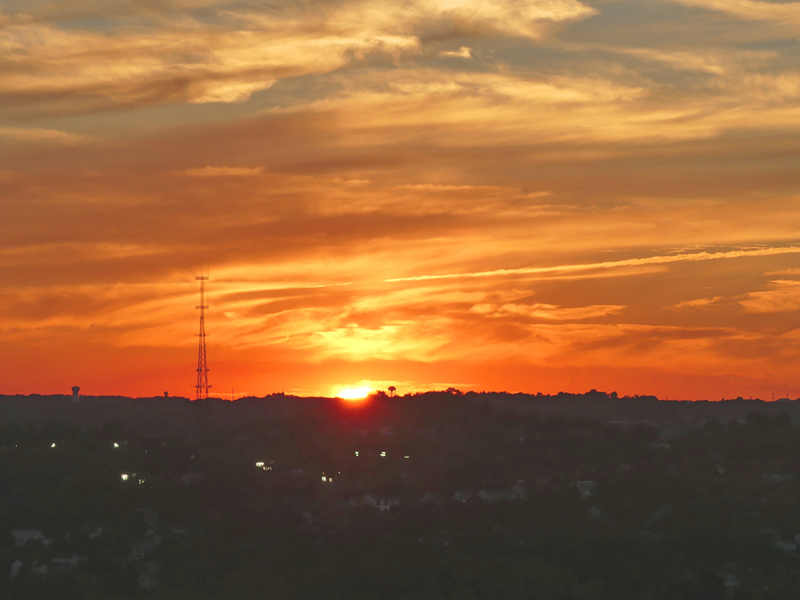 It sits high on top of Mount Washington overlooking Pittsburgh and offers spectacular views of the city. All wonderful but combined, it creates a dining experience that transcends each of the parts. We dined there on a recent press trip and it was worthwhile for any one of the components but combined it was an over-the-top experience. Monterey Bay Fish Grotto's seafood is flown in fresh from Monterey Bay daily, hence the name. You can order just about any kind of seafood from swordfish to tuna and anything in-between. If you are not into seafood, no problem, you can have steak, pork or chicken. Likewise, if you are a vegetarian, there is a special ravioli for you. You can make a hearty meal of their sharable sides, like Gratin Potatoes, smoked blue cheese, truffle or the very filling Lobster and Crab Mac and Cheese. Of course no matter how fresh the food is it's the chef's touch that makes or breaks it. The executive chef here, Eric "Spudz" Wallace, has a magic touch. He told us, "Food for me always had this weird twisty tale." Fitting idea as his food reflects his life. The items like Champagne Braised Cabbage give you a hint of his Eastern European background. 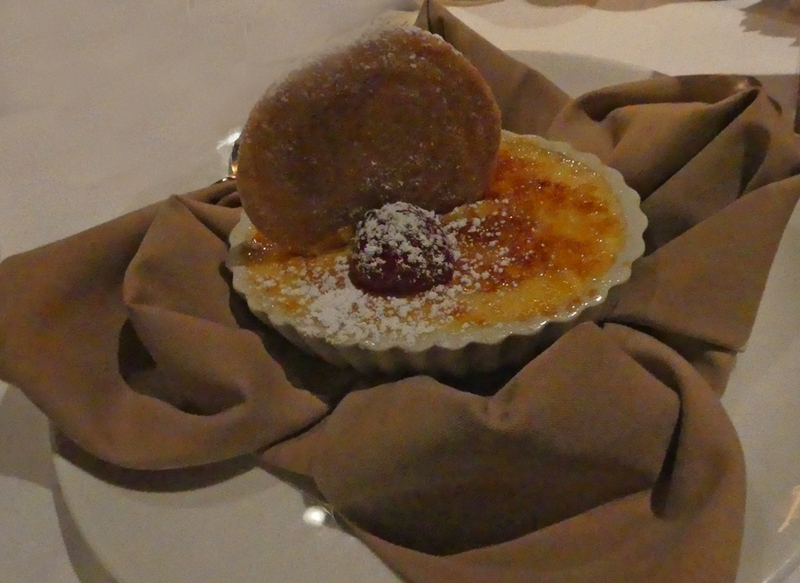 Chef Wallace's family is of Serbian decent and he was brought up in the family traditions. In his career, he had worked with some of the best like Lidia Bastianich of Lidia's Italy TV show who has her own restaurant there called Lida's Pittsburgh. He worked the lower end of the food chain as well growing up with a family pizza restaurant and later sorting fish in a warehouse. He has spread his wings far indeed. There are many other influences in his dishes. Italian, French, Cajun, Oriental and Thai can all be found in his dishes. 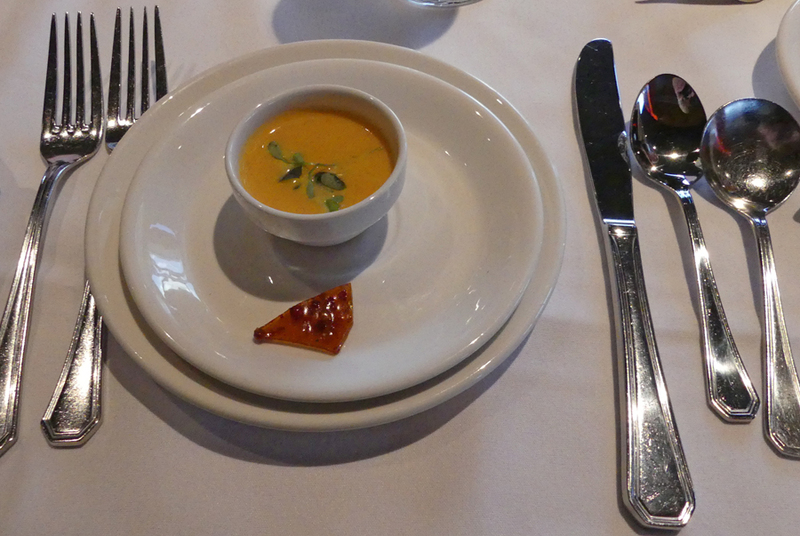 For starters, I passed on some tempting looking salads and tried the Lobster Bisque. It was creamy and had a generous amount of real lobster in it. So yummie! 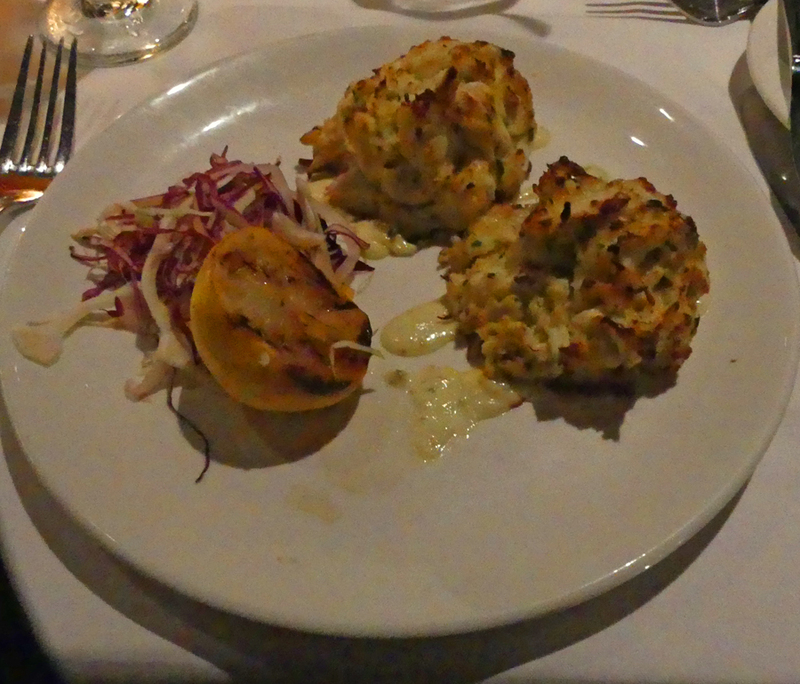 For an entree I had the Crab Cakes filled with lots of Maryland jumbo lump crab meat. The flavor was rich and delicious. We passed around a bunch of the shared sides. I particularly loved the Gratin Potatoes, smoked blue cheese, truffle and the Lobster and Crab Mac and cheese. You might notice that Chef Wallace is very big on cheese. It is a combination of many of his dishes. Fine by me as I love most cheeses. His Chipotle Creamed Corn has just the right tang to it. 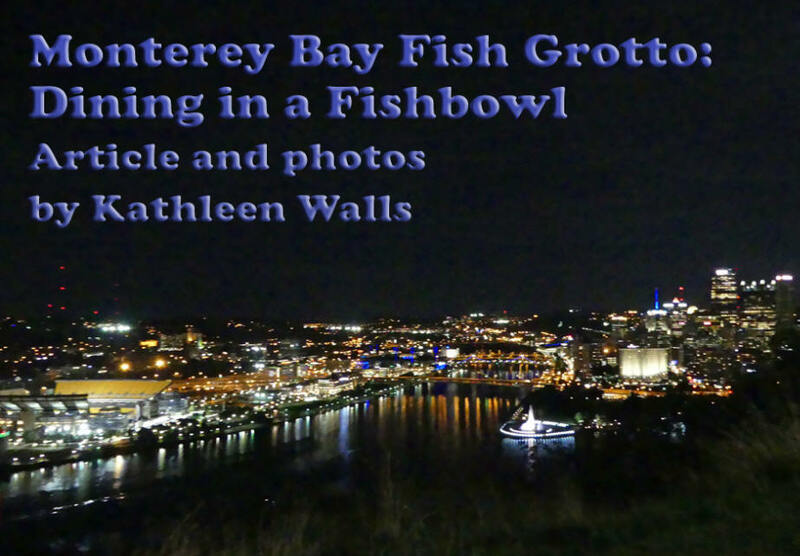 Monterey Bay Fish Grotto may have another meaning for its name. Inside you are in an almost glass-enclosed room. Just like a fish bowl, you can look outside from any side and get a fantastic view of Pittsburgh. We were there at sunset and had a fantastic celestial show. The show continued after the sun set and the stars came out. The lights of the city below gave a whole new prospective to city view as you can see in the header image.